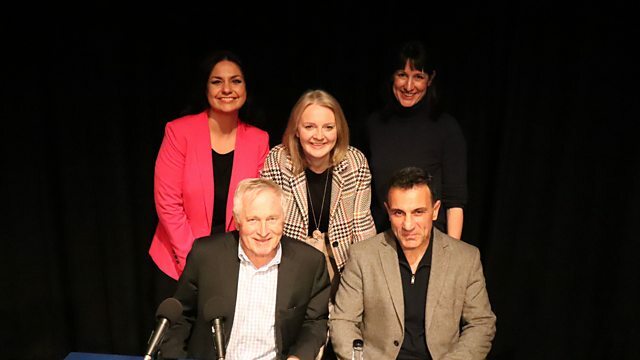 Jonathan Dimbleby presents topical debate from the Fisher Theatre in Bungay, Suffolk with a panel including Rachel Reeves MP and Liz Truss MP. Jonathan Dimbleby presents topical debate from the Fisher Theatre in Bungay, Suffolk. On his panel are the Independent Group's Heidi Allen MP; Costas Lapavitsas, former Syriza politician and now Professor of Economics at SOAS in London; the Labour MP Rachel Reeves, chair of the Business Committee; and Chief Secretary to the Treasury Liz Truss MP. They discuss the current debate around Chris Grayling and the settlement to Eurotunnel of £33m, the 2.7% pay rise for MPs, whether brinkmanship is a good tactic in negotiating Brexit, and the concept of loyalty.